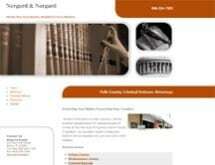 The law firm of Norgard and Norgard in Bartow provides vigorous representation for people accused of felony and misdemeanor crimes in Central Florida. As criminal defense lawyers, Robert Norgard and Andrea Norgard are fully committed to providing proactive representation in every case. Robert Norgard has been Board Certified in Criminal Trial practice since 1995, and he has also been selected to Florida Super Lawyers for each of the last four years. Mr. Norgard has defended clients in more than 200 jury trials over the course of more than three decades. Andrea Norgard is a former public defender who has handled hundreds of appeals during the course of her career. Together, they form an experienced defense team capable of handling the most challenging cases. Norgard and Norgard is selective in the cases it handles. The law firm defends people accused of felony crimes, such as white collar crimes, assault, murder, drug crimes, as well as misdemeanor crimes. At Norgard and Norgard, every case is important. When defending a client, the law firm is determined to achieve the best possible outcome. Depending on the needs of the case, the firm can call upon experts in professional disciplines such as private investigation, forensic accounting, psychology and other specialties. Whatever the nature of your case, the criminal defense lawyers at Norgard & Norgard will represent you with passion, skill and determination.